Our legs, like every other body part, need some sort of attention everyday to help them to remain strong, flexible, and grounded enough to help us carry out our daily chores in the most efficient manner. Taking care of legs is not rocket science. Setting aside a few minutes everyday for yourself on the mat can give you those healthy, lean, and toned legs you’ve always longed for. 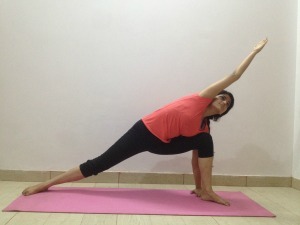 A pose inspired by the faithful friend of man, the dog, Downward Facing Dog, or Adho Mukha Svanasana, is highly effective in strengthening ankles, toes, and knees, while stretching the shoulders, back, and calves. It lengthens the muscles, thus increasing the range of motion and flexibility. Start with palms and feet on the floor, fingers spread out like a star, and knees bent directly below hips. (Yes, it begins as a seated pose.) Inhale deep and prepare your mind and body to push your hips towards the ceiling. Slowly exhale as you gently lift your hips upwards, straightening the knees and balancing weight on the palms and soles of the feet. While performing this pose, send your gaze in between your toes and don’t let your head hang in between your arms. Hold the position for 15-30 seconds as a beginner. Gently exhale and revert to the starting position. Low Lunge, or Anjaneyasana, is a yoga pose which works wonders to improve strength and flexibility in the hips, legs, shoulders, and knees. To begin, start in Downward Facing Dog. From there, exhale and step your right foot forward between your hands. Lower your left knee to the floor, placing the top of the foot on the floor. Now, inhale and lift your torso upright while sweeping your arms out to your sides and up overhead. Your arms should be straight and perpendicular to the floor. Keep your chin lifted slightly, but not so much that it compresses your neck. And remember to avoid slouching! Warrior II Pose, or Virabhadrasana II, is extremely useful in strengthening and stretching the legs, ankles, shoulders, and arms. The arms, shoulders, hips, and legs should all lie in the same plane, and your lower body should feel grounded in the pose. 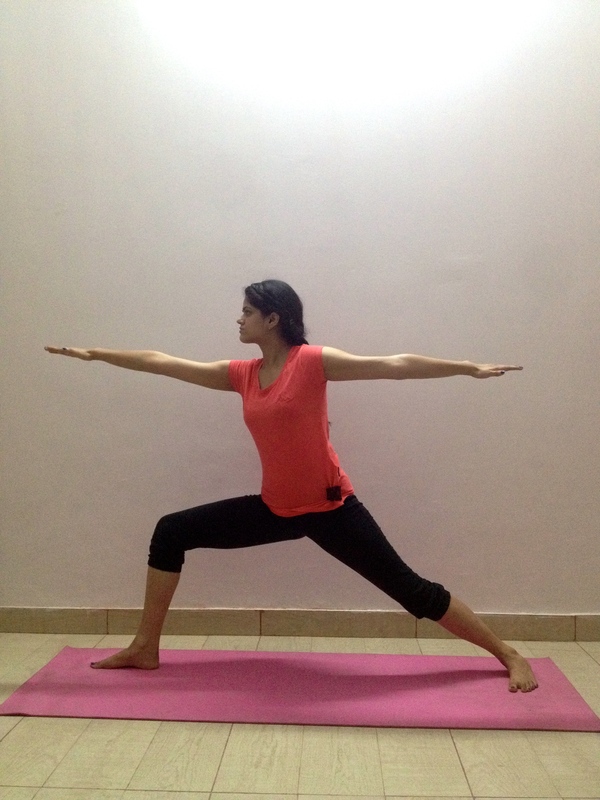 Stand in Mountain Pose (Tadasana). With an exhalation, step your feet 3 1/2 to 4 feet apart. Raise your arms parallel to the floor and reach them actively out to the sides, shoulder blades wide, palms down. Turn your right foot slightly to the right and your left foot out to the left 90 degrees. Exhale and bend your left knee over the left ankle, so that the shin is perpendicular to the floor. If possible, bring the left thigh parallel to the floor. 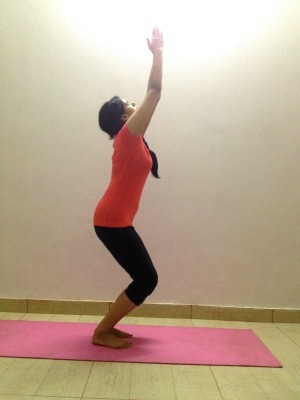 Stretch the arms away from the space between the shoulder blades, parallel to the floor and directly over the pelvis. Press the tailbone slightly toward the pubis. Turn the head to the left and look out over the fingers. Stay for 30 seconds to 1 minute. Inhale to come up, then reverse the feet and repeat the asana on the next side. 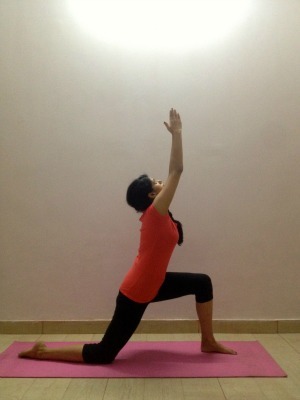 Extended Side Angle Pose, or Utthita Parsvakonasana, increases ankle power and flexibility. It stretches the legs, ankles, and knees. Start by standing straight and then exhale and separate your feet to about three feet apart. Raise your arms parallel to the floor. Turn your left foot slightly to the left and the right foot facing forward. Slowly turn your left thigh outwards so that the center of knee and the ankle of the left foot are in the same line. Inhale and slowly bend your left knee over the left ankle so that the shin is perpendicular to the ground. The left thigh is now parallel to the floor. Your right leg is straight and stretched from hip to ankle. In this position, slowly extend your right arm above your head on your left side. The palm should be facing the floor and it should be straight. The arm should also touch your right ear. Slowly turn your face inward and look at the palm. Your other arm should be touching the ankle of the left leg without taking support of the shoulder or the ankle. Chair Pose, or Utkatasana, is one of the most powerful poses in this sequence. The very thought of sitting on an imaginary chair enables us to locate that strength in our body, especially the hips and thighs. Stand erect with your feet slightly apart. As you inhale, raise your arms over your head to bring your palms together and gaze towards your thumbs. On the exhale, bend your knees and lower your pelvis. Sink deeper into the imaginary chair by gradually lowering down, and then sit down in Sukhasana (a cross-legged posture). If you want, you may lie down on your back and relax. Reclining Big Toe Pose, or Supta Padangushthasana, is done by lying down on the back, holding the big toe with the fingers and stretching the other leg straight on the floor. This gives an intense stretch to the legs, the calves, and hamstrings, increasing blood circulation in the legs, flexibility in the pelvic area, and helps opening the chest by the pull of the arms. Half Frog Pose, or Ardha Bhekasana, stretches the throat, chest, abdomen, groin, thighs, and ankles. Lie on your belly. Press your forearms against the floor and lift your head and upper torso. Bend your right knee and bring the heel toward the same-side hip. Supporting yourself on the left forearm, reach back with your right hand and clasp your foot. Did you notice you resembled a frog while attempting this pose? What are your favorite poses to strengthen your legs and thighs? Share with us below!